The National Association of Disability Examiners (NADE) is a professional organization for analysts, medical consultants, support staff, hearings officers, field office representatives, administrators, and managers involved in disability determination. 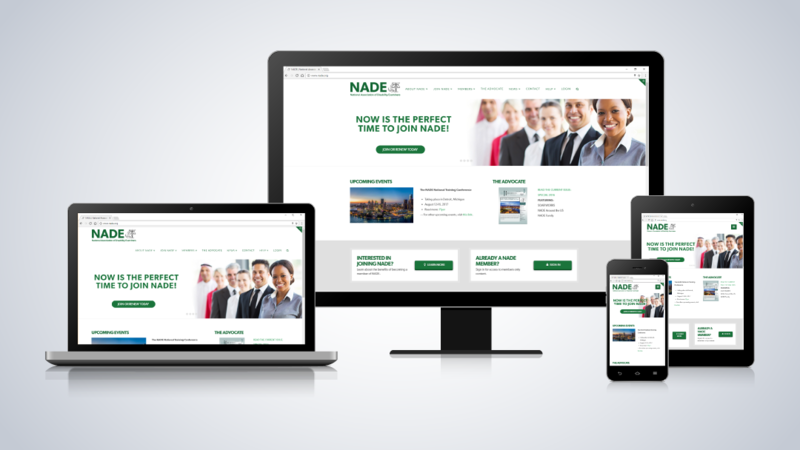 NADE had a website that had been in operation for more than 10 years, but it was difficult to update and lacked functionality. They had also been managing their membership database manually and paying a third party to maintain it; as an non-profit, this was unsustainable. They wanted a website that would attract new members and make it easier for existing members to find information. They also wanted a way to manage new memberships and renewals, without having to process them manually. Underwood Creative designed and developed a new custom responsive WordPress website with updated branding and a custom membership registration system. We also created a members only area with restricted access to content, messaging, custom groups, and forums. In addition to a new website that they can easily update, NADE no longer has to process registrations manually and are saving thousands each year.